Posted on July 25, 2018 at 6:17 pm. Mold flourishes in environments that are damp and dark. This puts places like our basements and bathrooms at risk, but the garage is also a prime target for mold growth. Your garage is easily exposed to the elements as you enter and exit multiple times a day, making it easier for water to get inside. It’s often also used as storage for wet items that can facilitate mold growth more easily—for example, a rain-covered bicycle, a pair of snowy boots, or pool floats that haven’t completely dried. Water is just one part of the equation, though. Most garages are also poorly lit and poorly ventilated, creating a haven for mold growth. Mold spores can find their way into our homes and garages on the bottoms of our shoes or the paws of our pets. As you come and go, you leave your garage vulnerable. Here are a few suggestions for keeping mold out of your garage and avoiding a visit from a mold removal service. Mold loves cardboard—especially when it’s wet. Our garages can make excellent storage spaces for seasonal items or even keepsakes, but only if they’re stored properly. Get rid of carboard storage boxes and look for plastic or metal bins instead. Routinely check for any places where water is leaking into your garage, including around windows and along the seal of your garage door. Clean up any standing water, especially during winter months when it’s more likely to accumulate. Dry what you can, such as rainy outdoor gear or shoes, as you trek in from outside. If you do have to store wet items, keep them away from other items in the garage, and don’t store them against a wall or on a shelf, where there’s even less ventilation. 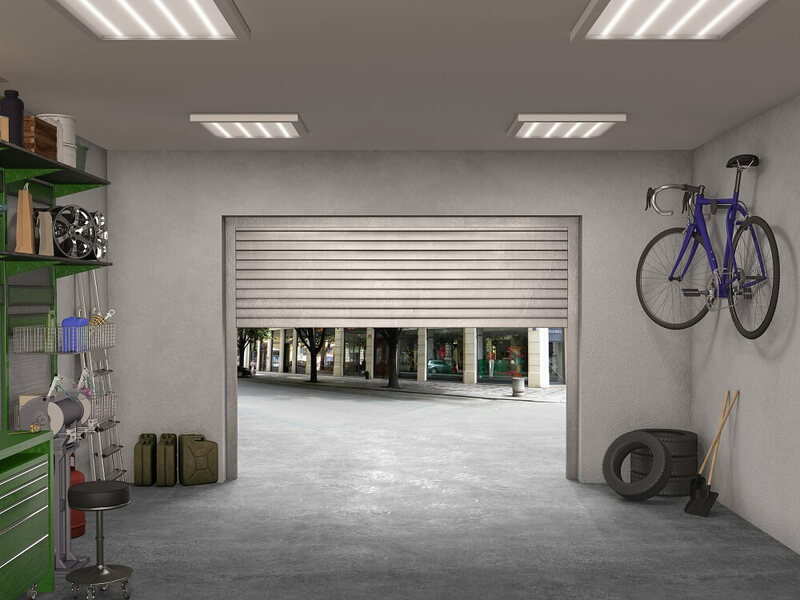 One of the best ways to keep your garage dry is to ensure there’s sunlight and good ventilation. Windows or sidewall ventilation fans are two options for keeping air moving through your garage, which can be installed by one of our home improvement experts. You may not be able to immediately ventilate your garage, and even if you do your part to minimize the amount of water that can accumulate here, you can’t always eliminate moisture. In that case, a dehumidifier can be one of the best investments for your space. You can find a list of dehumidifiers of varying price ranges here. Aim to keep the humidity in your garage lower than 60% for optimal results. Think you’ve spotted some mold in your garage? Consider bringing in a licensed expert for testing. Remember that one of the most insidious things about mold is that it’s often hiding out in places where you can’t see it. And even if the mold is visible, it’s safest and the most effective to leave the clean up efforts to a professional. Need someone to come take a look at a problem area or answer any questions for you? Our mold removal experts are here to help. Ready to get started? Call us at (812) 238-0154 for a FREE quote. M-F: 8:00 AM to 5:00 PM. This site has been elevated by Rise Marketing, Inc.